Before he became a writer for the Pulp magazines, O.B. Myers was a decorated WWI fighter pilot. He is able to bring those experiences to life in his fiction about the air war in Europe. In this volume we introduce you to two of Myers’ best series. 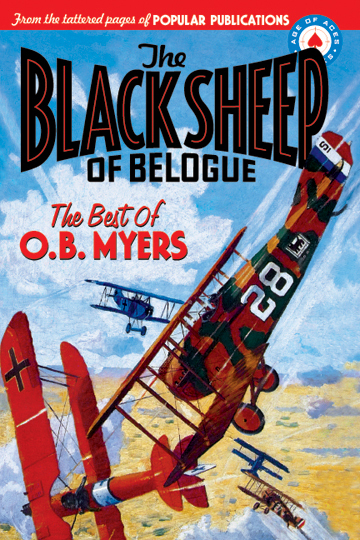 The Black Sheep of Belogue: After his arrest for striking an inept superior officer, Yank ace Dynamite Pike escapes court martial and hides out at a hidden drome in the forest of Belogue. Along with his trusted mechanic Splicer Teale, he wages a private war against the Germans while also trying to evade capture by the Allies. These outlaw eagles, who call themselves “The Black Sheep of Belogue”, blaze an explosive trail through Europe’s war skies! The Mongol Ace: Crack American pilot Clipper Stark is assigned the terrible task of stopping the seemingly invincible “Mongol Ace”. Janghiz Kaidu, a descendant of Genghis Khan, joins the German army so he can kill more of the hated Russians. Instead he is shipped off to the Western front where he is trained as a pilot. His sadistic nature makes him the Allies’ most feared and despised adversary. Only Clipper Stark can match the Mongol Ace’s ferocious skills. But can even he kill the unkillable? We also have two articles about Myers’ wartime exploits by fellow pilot Kenneth Porter that originally appeared in Battle Aces in November 1931. The Frederick Blakeslee cover painting depicts the actual dogfight that won O. B. Myers the Distinguished Service Cross.